Q: What is Bulletproof Spirit about? A: “Bulletproof Spirit: The First Responders Essential Resource for Protecting and Healing Mind and Heart” is an emotional survival guidebook—a wellness resource for police officers, fire personnel, the military, paramedics, nurses, hospital trauma workers, as well as their spouses and loved ones. It provides, for the first time, over 40 proactive wellness strategies and emotional survival methods that work to protect, heal and nurture the spirit of those who serve—so they will no longer suffer from all of the negative aspects of their profession. The book provides first responders with a message of hope, and a path toward wellness. Q: What made you decide to write a book? 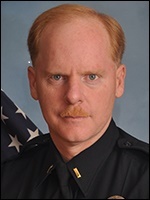 A: I have been a police officer, now a captain, for nearly 26 years and not only have I suffered from the terrible things I have experienced, but I have witnessed numerous colleagues suffer from PTSD, depression, substance abuse, and many other physical and emotional ailments that have all been brought on and aggravated by what we experience at work. There really isn’t any effective training or information available that addresses how a first responder can proactively work to insulate themselves and protect, heal, and nurture their spirit so they will not only survive, but thrive throughout their careers. Suicide is the number one cause of death for first responders. Every year nearly 200 officers take their own life. 21 military veterans and 1 active duty soldier kill themselves every day. 120,000 police officers go to work every day suffering with PTSD. There is a tremendous need to provide emotional survival information and training for all these heroes who sacrifice a part of themselves to protect and give life to others. An officer with a damaged spirit is not only susceptible toward self-destructive behaviors, but they are also unable to provide the most effective and professional police services for the community, which needs and demands them to be at their very best. Bulletproof Spirit provides the training, resources, and essential information to keep them well. A: The genesis for the book began in 2010 when I attended the FBI National Academy in Quantico, Virginia. I took a course regarding emotional survival taught by a supervising special agent of the Behavioral Science Unit. Since then I have read numerous books on the subject—though none of them really offered effective wellness methods that could be used as a proactive strategy toward emotional survival. Much of the literature that was available primarily dealt with all the reasons why first responders suffer from their work. I’ve consulted with several experts in the field, such as Nancy Bohl-Penrod, Ph.D., of the Counseling Team International, and have instructed with her. In addition, I have nearly 26 years of police experience, work on our peer support team, and have established and coordinated my agency’s Wellness Program. I continue to travel and teach first responders regarding emotional survival strategies. Q: What are some of the professional experiences you drew from for the book? A: Most of my career has been as a detective investigating murders, child abuse, and crimes of violence. I have also been a SWAT Commander and a member of our peer support team. I worked a child molest case where the suspect had over 700 photos of infants and small children being sexually assaulted; I have crawled on my hands and knees inside a body bag in order to collect maggots so that an entomologist could estimate the time of death. I have had my police car rear window shot out, I’ve chased attempted murder and armed robbery suspects at 120 mph and caught them; I’ve worked cold case murders, one taking me five years to solve. I worked a case where a woman was attacked inside her home and stabbed 76 times, until the knife blade broke off in her skull. And I have witnessed numerous autopsies where I not only collect evidence from the dead body, but have gotten covered in skull dust as the Medical Examiner used a high powered saw to cut through the victim’s skull to remove the brain. Every time I suffered with my victims, each case of senseless violence, every evil act that devastated so many lives—all became very toxic and poisonous to my spirit. Through many years of trial and error, I discovered what actually worked to breathe life back into my spirit. Q: What are some of the major principles you teach in your wellness training? A: The most important principle to realize, is that if we do not do anything proactive toward our own emotional survival, then we will inevitably suffer from the inherent negative aspects of our profession. First responders must also learn to become much more self-aware to understand how the job has changed them—their health and wellness, their relationships, their view of others, and the quality of their lives. When first responders neglect the importance and wellness of their spirit, then they are in danger of turning into someone their loved ones no longer recognize. I describe several warnings signs that indicate that your spirit is suffering and not constructively processing stress or trauma. I also detail how first responders can overcome the daily hypervigilance roller coaster, how to prepare for and mitigate the effects of trauma, and numerous ways that our loved ones can become our most critical life-line of support. It is crucial for first responder agencies to develop an effective peer support team, a wellness program, effective use of chaplain services, and ongoing proactive wellness and emotional survival training for the good of the officers, the agency, and the community. Q: What case that you had as a homicide detective was the hardest for you to deal with emotionally? A: The worst was a case where a middle-aged man was taken about 120 miles away from my city and murdered—and had his head and hands cut off. We never did find the victim’s head or hands and the body was dumped in an alley. We had no cause of death, no murder weapon, no murder scene (he was killed and cut up in another unknown location), no witnesses to the murder, no confessions, no DNA, no fingerprints, and no physical evidence of any kind of the suspects. I spent five years immersing myself in a world of pimps, prostitutes, violent gang members, and drug dealers. I received death threats from the suspects, and was being followed by one of their accomplices. I became obsessed with working this case, while at the same time needing to work all my other cases that kept coming in. I got very little sleep, had difficulty in my marriage, and became very paranoid. However, after 5 years, 2 Crip gang members were convicted of first degree murder. Q: What do you believe causes first responders to have suicidal tendencies? A: Many officers suffer from PTSD without knowing that they have it. They suffer extreme panic attacks, horrible nightmares, debilitating stress, crippling intrusive mental images, and eventually they can begin to feel hopeless as the quality of their lives continues to disintegrate. Officers also feel a great sense of helplessness. Often we are unable to save a child, stop someone’s suffering, or arrest a violent suspect before he is able to victimize again. This sense of helplessness can also lead to guilt feelings, where the officers continually second-guess their actions—thinking there could have been more they could do. Additionally, there still is a sense that seeking help is a sign of weakness. What we all must realize, is that PTSD is not a weakness. It is not about what’s wrong with you; it’s about what happened to you. It is actually an injury to the brain’s ability to process a traumatic event. There are effective treatments available that can help heal the brain’s processing ability so that memories of the event are no longer crippling. Q: What are some of the warning signs family members should look for? Isolation: First responders tend to come home and isolate themselves, so that they can unwind and get ready for the next shift. They become disengaged and indifferent. This creates distance and frustration in relationships. Anger: The first responder will tend to become increasingly angry at things that never used to bother them. Family members walk on egg shells fearing another angry outburst that they don’t understand. Sleep problems: 40% of first responders have serious sleeping disorders, and only get about 4-5 hours each night—when 8-9 hours are needed for our emotional, physical, and mental well-being. Depression: Left unattended, the negative aspects of our jobs can leave us feeling not only exhausted all the time, but depressed, moody, and agitated. Drinking as a perceived need: First responders have twice the rate of alcoholism as the general population. Drinking as a need in order to relax, fall asleep, or to forget, is a significant warning sign that your spirit has not been processing stress and trauma. Emotionally dead: As a way to cope with being able to do our job while in the midst of heartache and helplessness, first responders develop the natural reaction of shutting down emotional feelings. Over time this tends to make them unable to feel—being emotionally dead inside. This, of course, becomes devastating to personal relationships. It is essential to treat, protect, and train all components that make us human, our mind, body, and especially our spirit. It is our spirit that is so critically important. It is our spirit that enables us to cope with stress, overcome trauma, and serve with compassion. Our spirit is the reservoir of our motivation to be committed to public service and helping others, to be inspired, and to be hopeful. Our spirit is the foundation for our mental, emotional, and physical health. We neglect our spirit at the expense of our own well-being. Q: What do you think draws a person to a career in law enforcement in the first place? A: Nearly all of us were driven to become a first responder because of our compassionate spirit to want to stand up to evil and to protect others from suffering. First responders dedicate their lives to protect and give life to others. This should give us great satisfaction and be life affirming—yet too often our service for others results in our spirits suffering. I am constantly amazed and inspired by the level of selfless service, sacrifice, commitment, and dedication of those who work at my side. I only wish the general public realized how much we give of ourselves in order to protect and serve them. It is absolutely the best job in the world. Q: What is the most misunderstood thing about detective work? A: Probably the most misunderstood thing about police work in general is that we are human; we suffer, fear, and bleed like everyone else. Yet we often look past our own needs in order to help those who need us. Every one of my colleagues would willingly sacrifice their life if it meant they could save another. The heart and spirit of those who serve in the face of evil and violence makes them all heroes. Yet we have families too. Each day when we say good-bye to our baby or kiss our spouse as we leave, we know we may never see them again. We care about protecting others more than our own welfare.